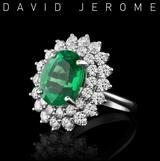 Comment: Bright grass green, less paraiba-ish than the images, a nice fresh color. Our Three-No policy in practice: No inclusions, no treatments, and no window. The handshots and side-images show tone and hue best; as often the front images are overlaid with brilliancy which is what you get when you look straight into a well-cut gem (one can move to the side but that's is not what is expected from a good photo). Not a precision-cut but pretty perfect even under the lens. High brilliancy, especially for a pear shape, hence the front-photo overload. 7x5mm is a good face-up for a sub-one-carat tourmaline. 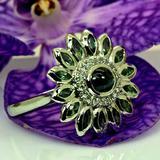 Can become a ladies' ring or even a delicate pendant. DSEF report, grading papers, global shipping and all other WildFish perks are included in our prices.